Successful completion is recognized with a “Record of Achievement” provided by Nunavut Arctic College. Municipal staff may take five additional courses specific to their job or future career path (there are seven career streams). Successful completion of ten courses is recognized with a Municipal Government Certificate. 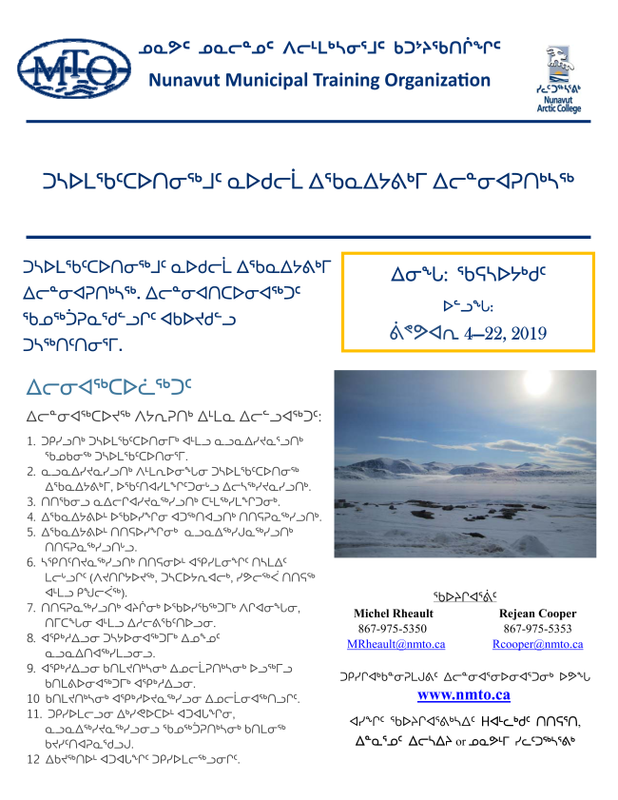 Many of the courses are also transferable to Nunavut and other College Certificate and Diploma Programs for those who wish to continue their education. Participants of this course gain a conceptual and operational understanding of operating systems and software applications with an emphasis on Word-processing and Excel. There is sufficient reinforcement to enable participants to acquire useable skills. Fees: This fee is currently set at $300 for municipal employees and most GN employees. This is the total cost for the course and all course materials. This training will take place face-to-face in a chosen community. Participants will create, edit and manage standard work place documents. Introduction to Northern Government is intended for all northern participants – those new to the North, as well as lifelong-residents. Through readings, audio, video and online activities, learners acquire an understanding of the history, scope and scale of federal, territorial and municipal government in the North, and of the relationships between the levels of government. Human Resources Management introduces students to the field of human resources management, from a community government perspective. Public Sector Finance describes the structure and function of each level of government in Canada, and how funds flow between them. Emphasis is placed on strategies by which local governments meet their financial responsibilities.